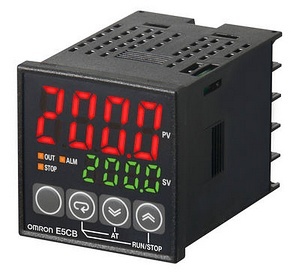 The Omron E5CB is a low cost entry level PID temperature controller. It is ideal as an alarm unit or for heater temperature contol. The large 4 digit display shows the measured temperature in red and target temperature in green. The controller has a choice of 10 alarm modes which activate the alarm relay (2nd output), the alarm is non-latching. The Run/stop function allows the control of the main output to be stopped, this done a via a front panel button. The controller features protection functions to hide or prevent changes to settings, so a supervisor can prevent operators from accessing functions such as Setpoint, Auto-tuning and Run/stop. The temperature input can be shifted to offset temperature sensor errors. The E5CB doesn't support Type N thermocouples and the setpoint limits are defined by the sensor input range, if these features are needed consider the Omron E5CC.